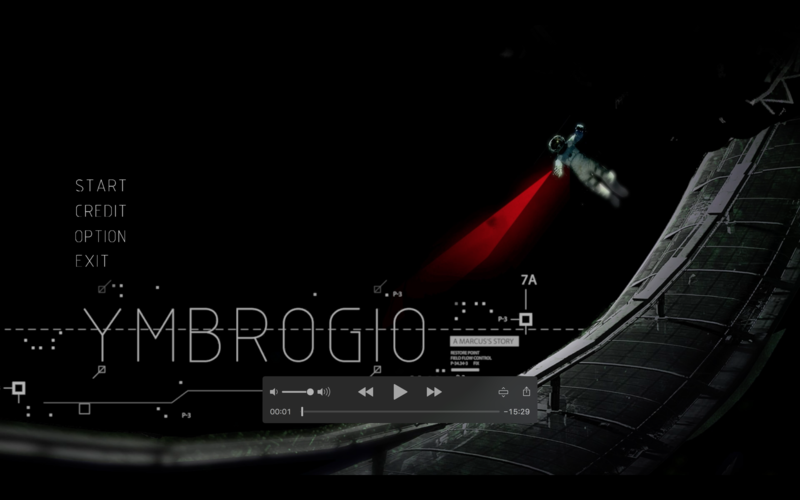 “Ymbroglio Alpha” is a science-fiction side-scrolling 2D puzzle-platform game in which players can control both a human astronaut (Captain L.) and a robot (Yridia), sometimes interchangeably or simultaneously, for the purpose of progressing to the next level. A meteoroid smashes against a Space Station by damaging the main satellite and killing a group of astronauts deployed in the Sector 2 area. Meanwhile, a survivor, suffering from amnesia, is the only confirmed survivor and must find his way to safety. With limited movement of his body and a transmission beam gun (TBG), he discovers a robot capable of managing ship’s controls and restoring the beacon to the primary satellite. Objective: Reach the end of any stage with the Astronaut and the Yridia by solving the puzzles involving the stage’s environment. After completion, [both] players must enter the door to the next stage. Captain L. has amnesia and does not know where he is. Yridia is activated after the Captain solved a simple puzzle and subsequently warns the astronaut about the damage and low oxygen levels. In order to learn more information and save themselves from danger, the two move from room to room to activate the previously disengaged power supply to divert the oxygen supply to Section 1 and turn on the main satellite and call for help from outside.